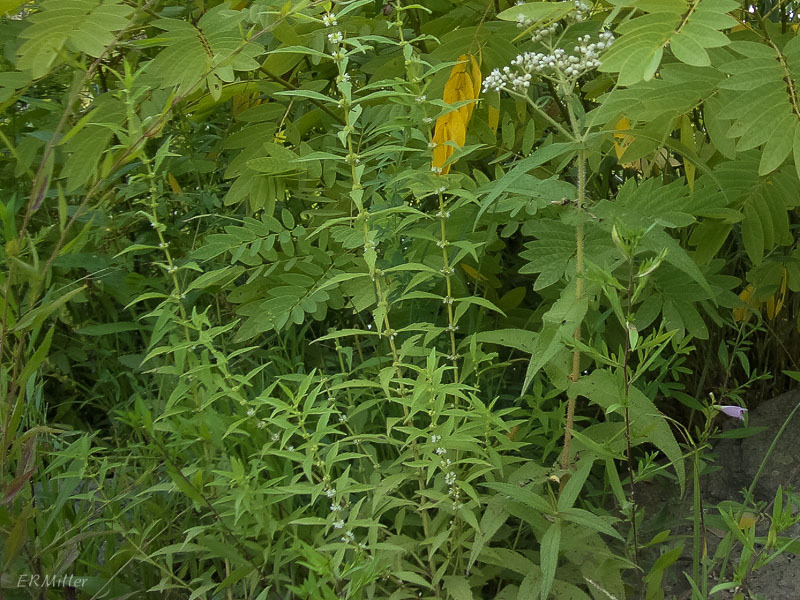 The last photo in yesterday’s post showed most of a single boneset, with a few other plants to its left – plants with small white flowers. They didn’t really register the day I took that photo. 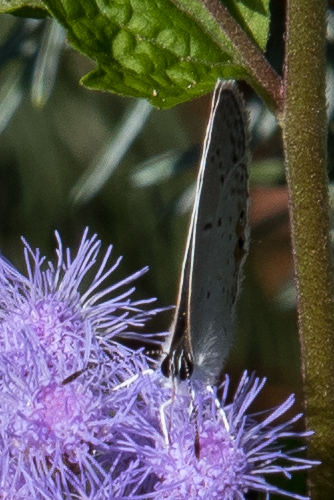 It was my first time out in a kayak with a camera (an ancient point-and-shoot with very low resolution), and I wasn’t able to maneuver close to the plants, and anyway I was totally focused on the boneset leaves. So much for excuses. I was looking at the picture on the computer and thought “what in the world…?” So I went back with a better camera (cleverly though cumbersomely packed to keep it dry) and got better pictures. But not great pictures. I was still unable to maneuver close to the plants, and the water was choppy, making it exceptionally difficult to keep the camera still. It was quick work to get to the genus Lycopus, but I’m still not sure the species is correct. 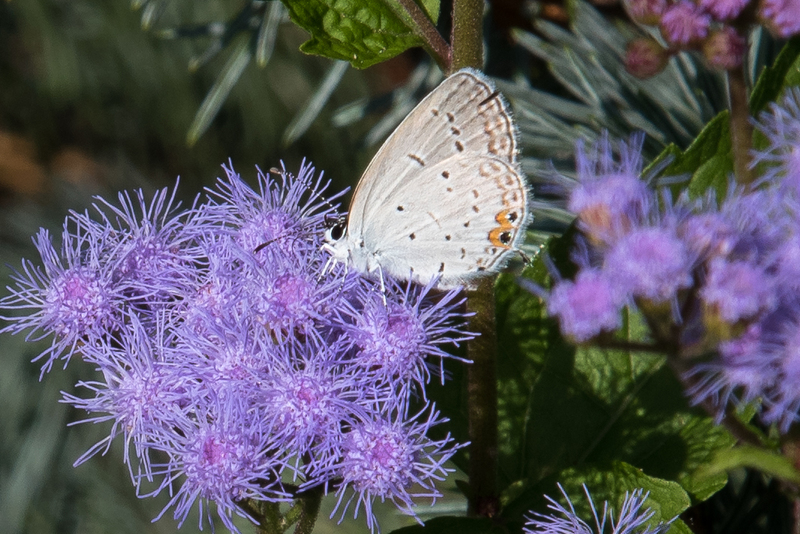 With help from the Maryland Biodiversity website I narrowed it down to three. Cross-checking with the excellent, detailed dichotomous key at gobotany.com didn’t help much, because I didn’t have enough or the right details in the pictures. 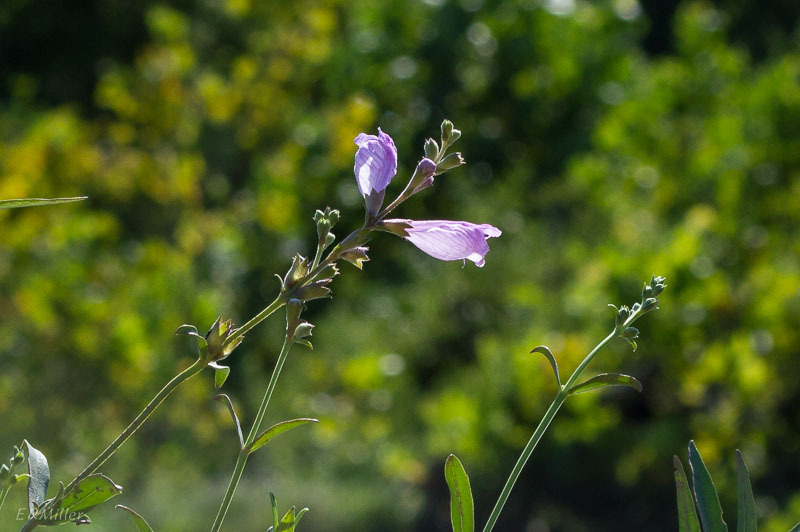 And the Illinois Wildflowers site, one of my go-to resources, offered some contradictory information. One thing I did learn: this is considered a tricky genus. At any rate, the bugleweeds/water horehounds are wet soil lovers (as is everything I’ve found growing in the lower Potomac Gorge). This one ranges from the Atlantic coast as far west as Texas and Minnesota. It’s threatened in Michigan. Why “Lycopus“? Beats me. 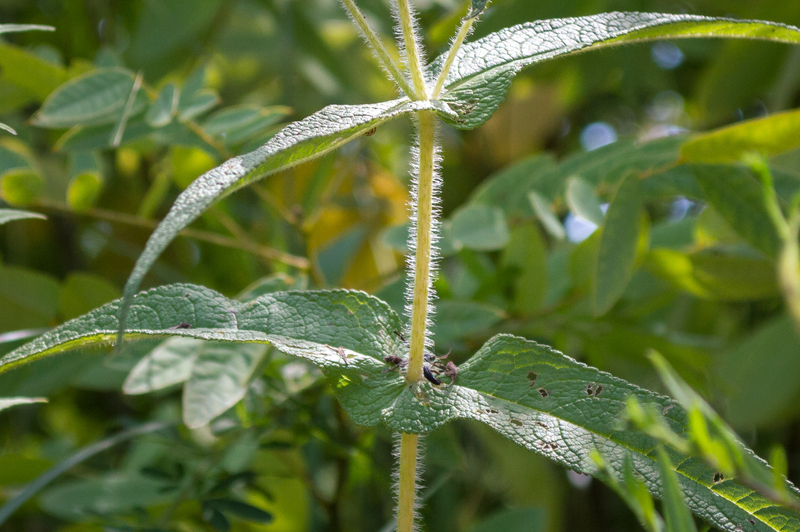 The lower leaves of some of the species are sharply lobed (more so than this one). Perhaps someone thought they looked like a wolf’s foot. 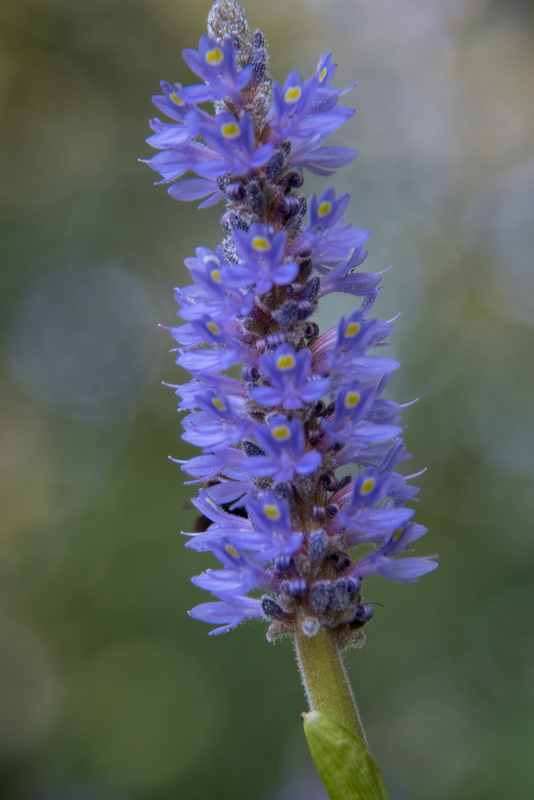 Common names tell us more about the name-givers than about the plants. UPDATE 12/30/16: I am virtually certain, after much study, that I got it wrong. 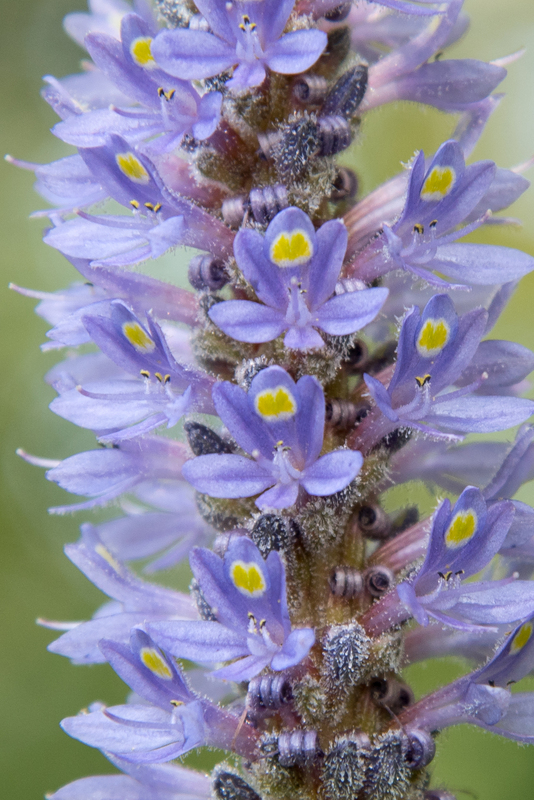 This one is northern bugleweed, Lycopus uniflorus. I’m not sure what compelled me to look closely at this particular cluster of tiny white fuzzy flowers. 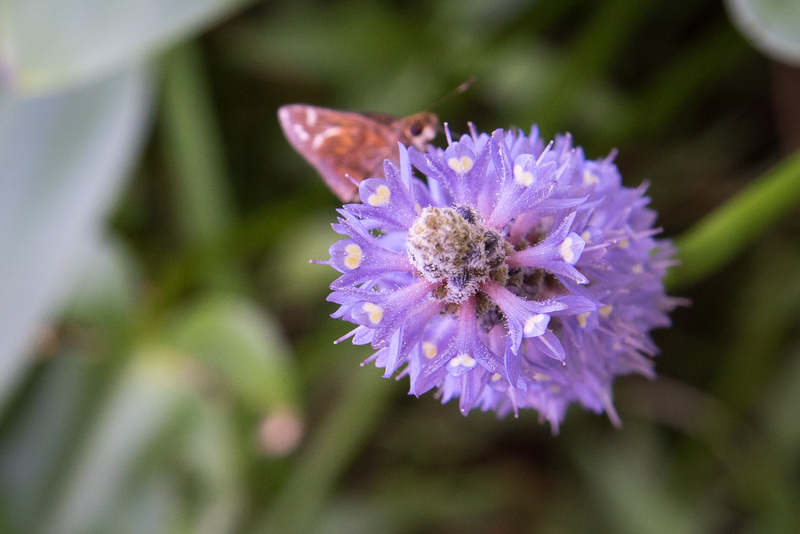 They’re all over the place at this time of year, in the form of late-flowering thoroughwort and white snakeroot. But for some reason I pulled the kayak up close to this one islet near Fletcher’s Cove, and there it was. This was a big deal because I’ve never actually seen this plant, despite it being fairly common. What sets it apart from the other Eupatoriums is the paired, clasping, opposite leaves that make it look like the stem is piercing a single leaf. 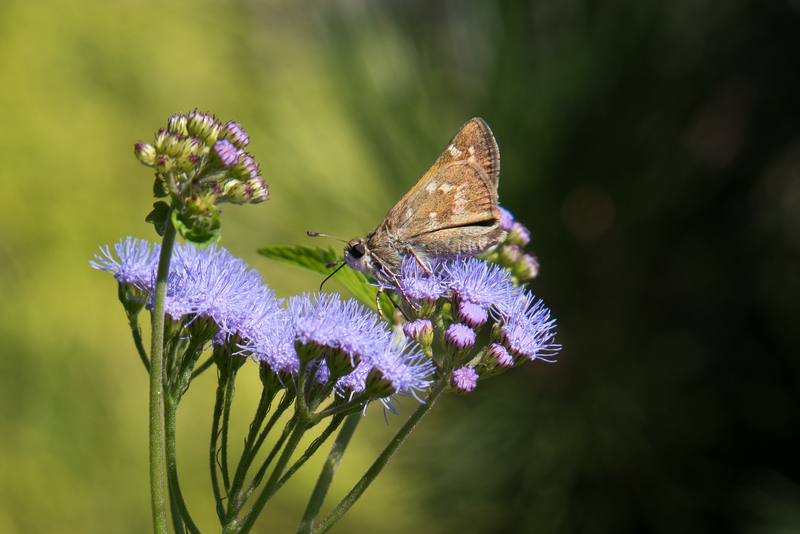 There’s nothing about the flowers to distinguish them from other bonesets or thoroughworts. 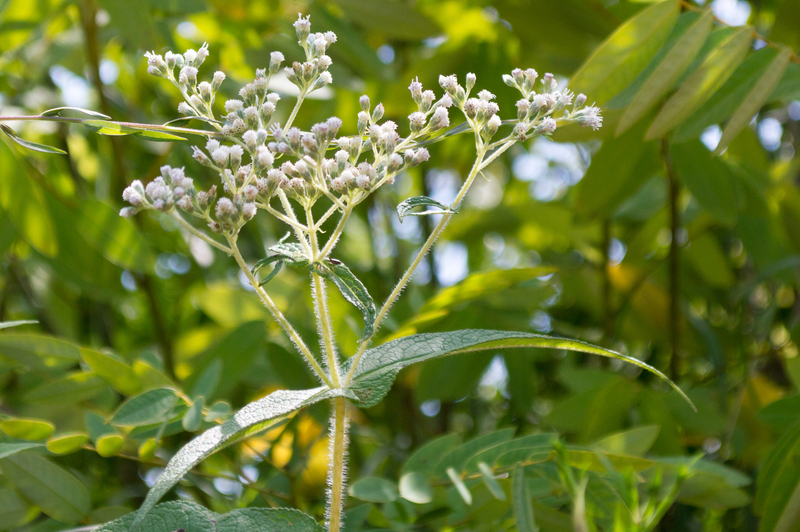 Boneset likes sun or a bit of shade and wet soils and is tolerant of flooding, so the rock outcrops near the banks of the Potomac are perfect habitat for it. The native range is from Texas north into Manitoba and all the way east to the Atlantic. 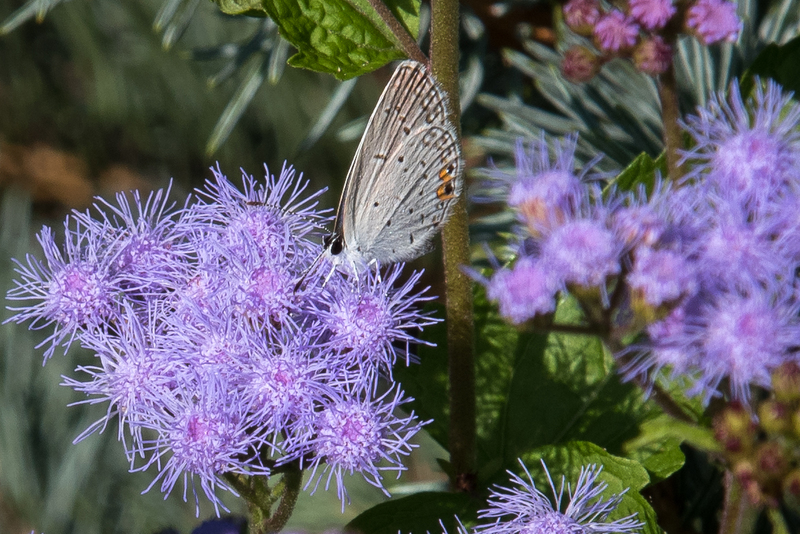 The genus Eupatorium once contained hundreds or species, including (in this area) the various bonesets/thoroughworts, mistflowers, snakeroots, and joe-pye weeds. Those last three have been moved to other genera, but that is a subject for another day. …hey, what about the other white flowers in that picture? Stay tuned! Another find from my exploration of the lower Gorge by kayak. I seem to have missed peak bloom, as there could be up to two dozen blossoms per foot-long spike. 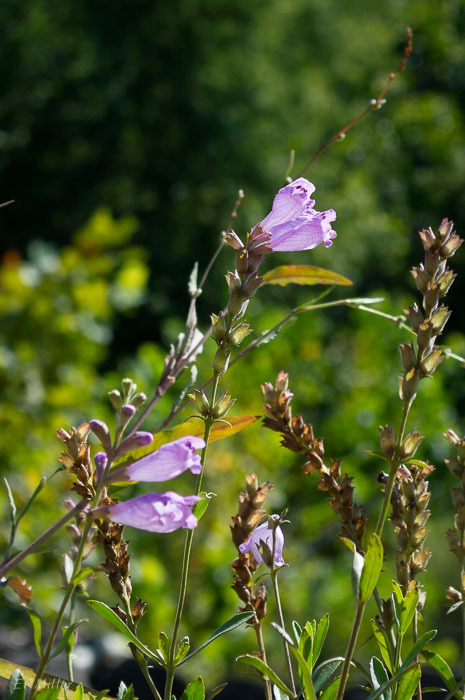 Obedient plant is a favorite of native plant gardeners, as it grows vigorously in good soil and sun, and is deer resistant. Its native range is across most of the US and Canada but for most of the West. It’s listed as special concern in Rhode Island, and is threatened in Vermont. About a dozen species of Physostegia grow in the continental US and Canada; of these, P. virginiana is by far the most widespread, and the only one found in the mid-Atlantic Piedmont. These plants were growing right atop the rock outcrops in the Potomac near Fletcher’s Cove, where I’d expect there is little soil that’s frequently flooded in the spring when the river level is higher. About those common names… supposedly, you can twist each flower into a different position and it will stay put, at least for awhile. How do people come up with stuff like that? 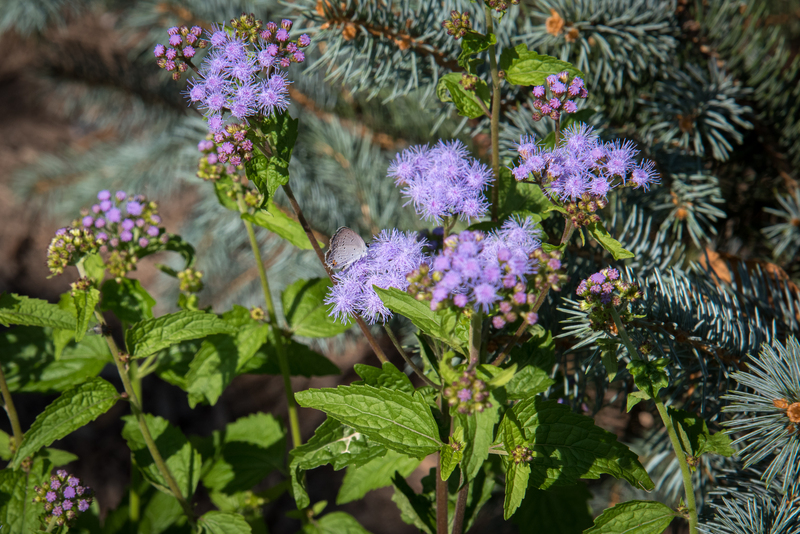 Pickerel-weed is an emergent aquatic, so you’ll find it along shorelines, forming large colonies of four-foot tall plants that bloom from summer into autumn. The flowers have two lips, an upper lip with two lobes and a lower lip with three lobes. 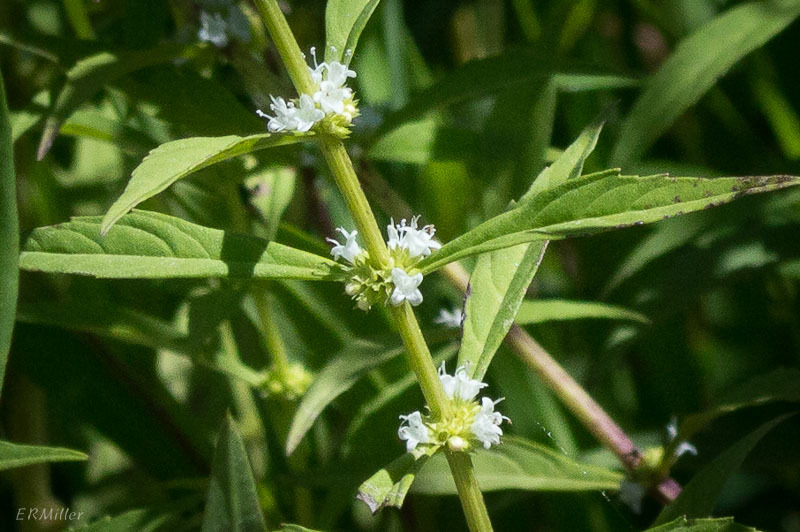 I’ve never seen it in the upper Potomac Gorge, but found masses of plants along the shores of the river downstream of Chain Bridge. 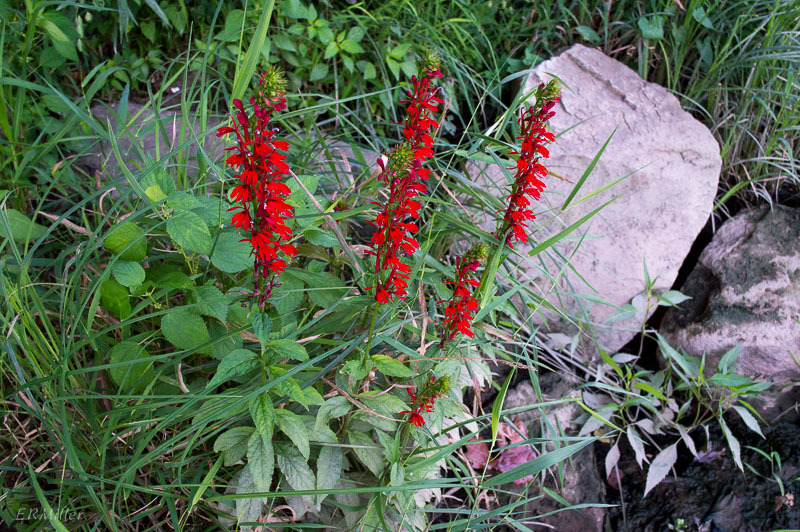 The flower spikes and heart-shaped leaves are typically about six inches long. And the skippers adore it. 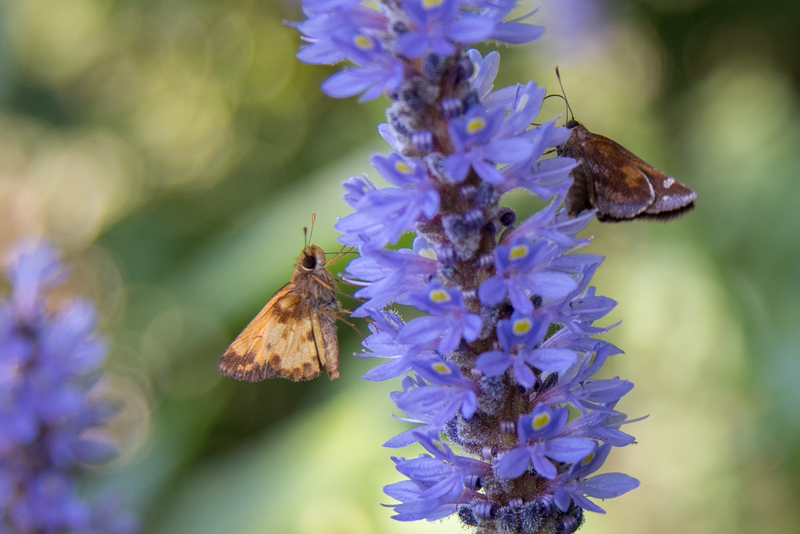 I believe the one on the left is a male zabulon skipper (Poanes zabulon); the one on the right is either a female zabulon or a clouded skipper (Lerema accius). 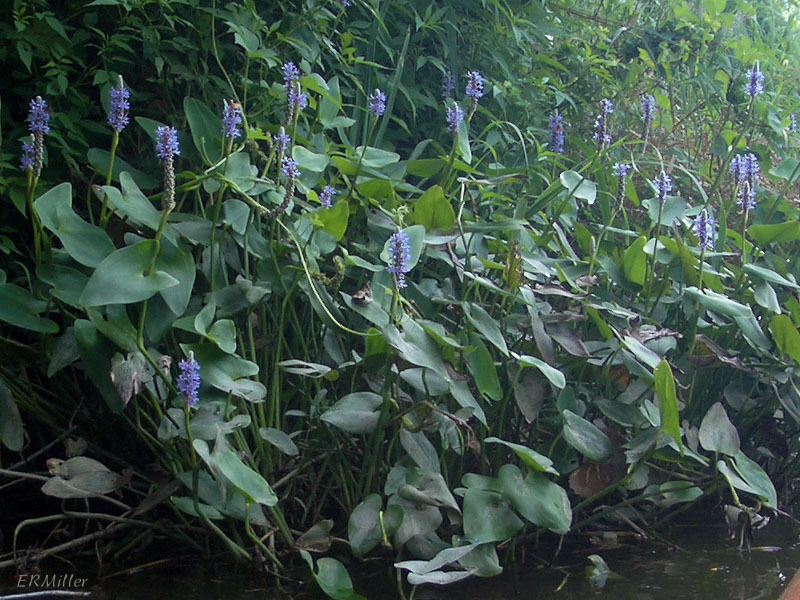 Pickerel-weed ranges from Texas to Minnesota and east (and is also found in Oregon and British Columbia). 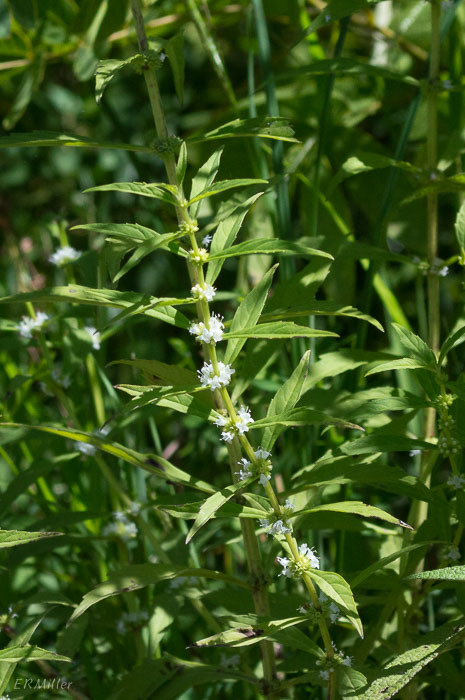 It’s threatened in Kentucky yet considered weedy by some authorities. 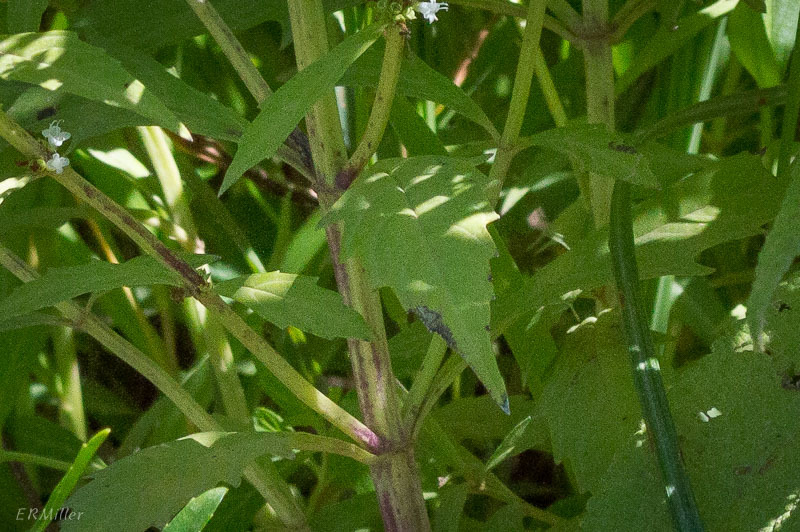 By the way, pickerel-weed flowers are generally a blue-violet color. All the pictures on this page (except for the colony) are of the same spike; I think some combination of shifting sunlight and camera position accounts for the apparent discrepancy in color. Here’s a cousin of yesterday’s unbelievably red flower. 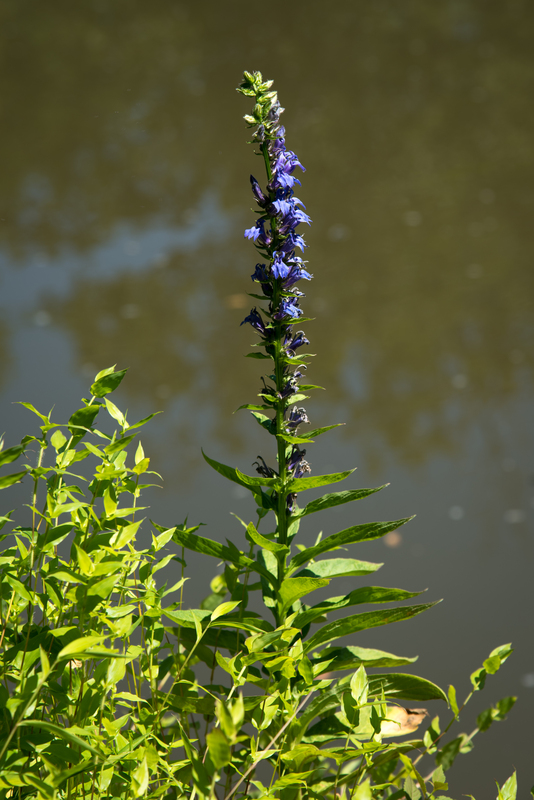 Like the cardinal flower, great blue lobelia is a plant of wet places. This single plant was growing right at the water’s edge near Fletcher’s Clove in the lower Potomac Gorge (in Washington, DC.). I looked all around for others, by boat and on foot, but this was the only plant I could find. Getting good pictures of it was darn near impossible. I could only get so close in the kayak, there was no place to land, and the sun was in a less-than-ideal position. When I went back a few days later to try from the shore, I still couldn’t get close: the bank was too steep, I couldn’t maneuver to different positions, and the sun was, again, not cooperating. 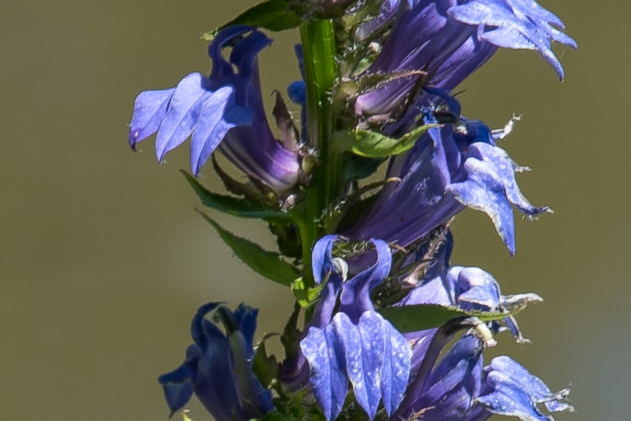 Great blue lobelia is found in the US and Canada from the east coast to the Great Plains. It’s listed as possibly extirpated in Maine, endangered in Massachusetts, and exploitably vulnerable in New York. 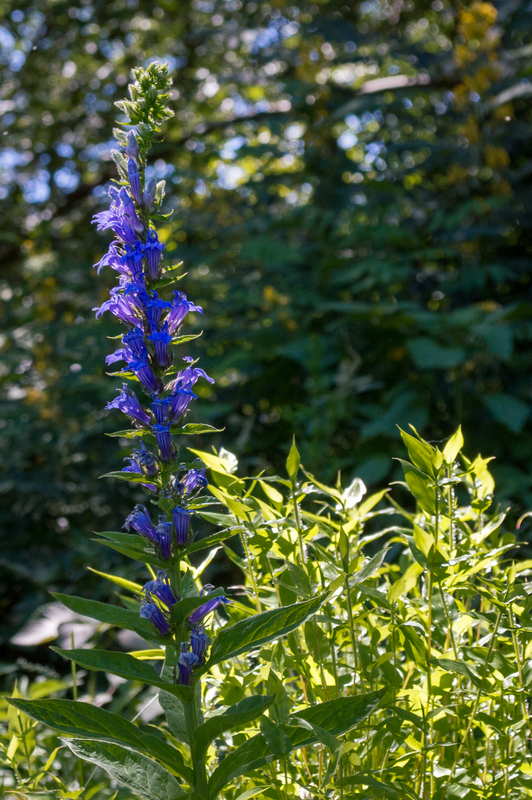 Twenty seven native species of lobelia can be found in the US, eight of which occur in Maryland*. 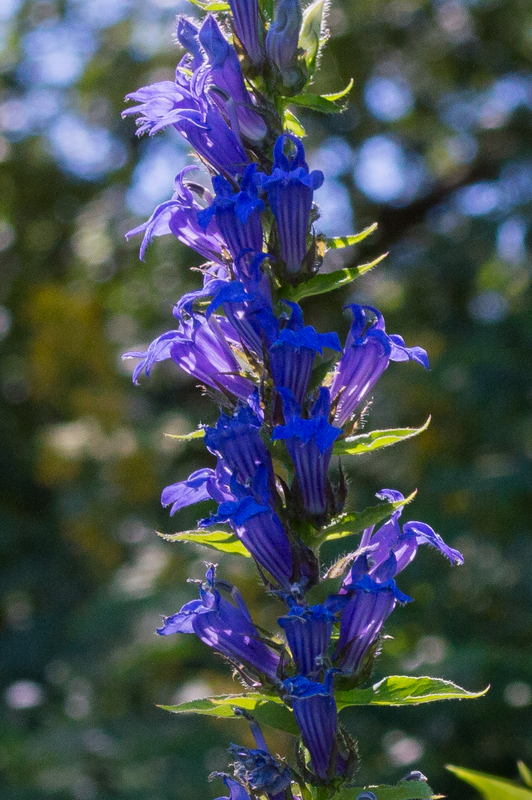 One of these, Indian tobacco, is fairly common in the Carderock-Marsden Tract area. 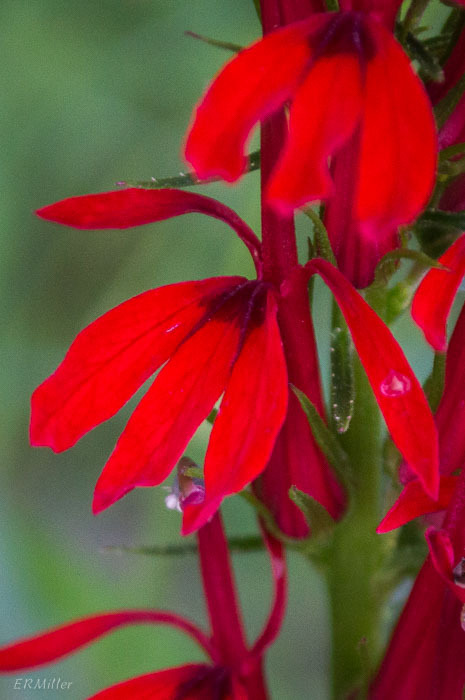 Of the more than 370 different flower species I’ve seen in the last two years, this is the only one that is truly, unequivocally, red. So very red, I practically squeaked upon seeing it. So very red, I actually beached the kayak and got out to take some photos (in the shade, in a strong, steady breeze). So very red, you’ll be forgiven for thinking I tinkered with the colors in processing (I didn’t). This stand of plants was right by the water, under the woodland canopy – exactly the habitat it prefers (wet with some shade). 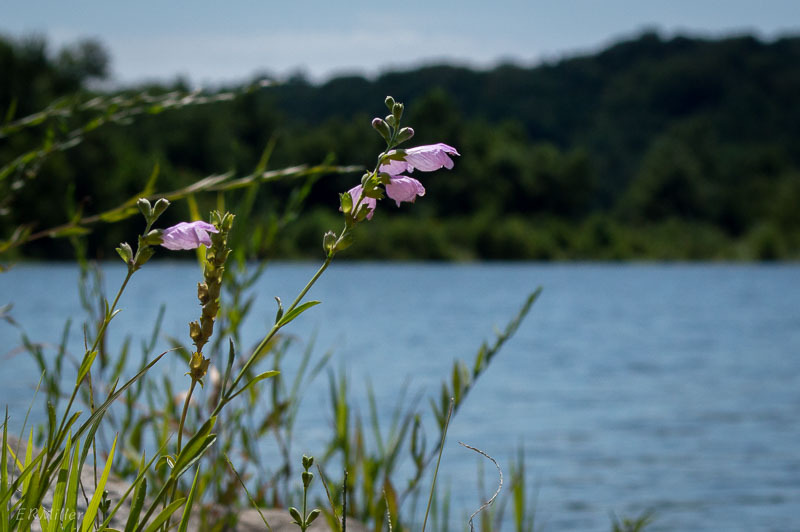 I explored every little cove and rock outcrop (okay, not every one) between Fletcher’s Boathouse and Chain Bridge, on both shorelines (DC and Virginia), and saw no others. 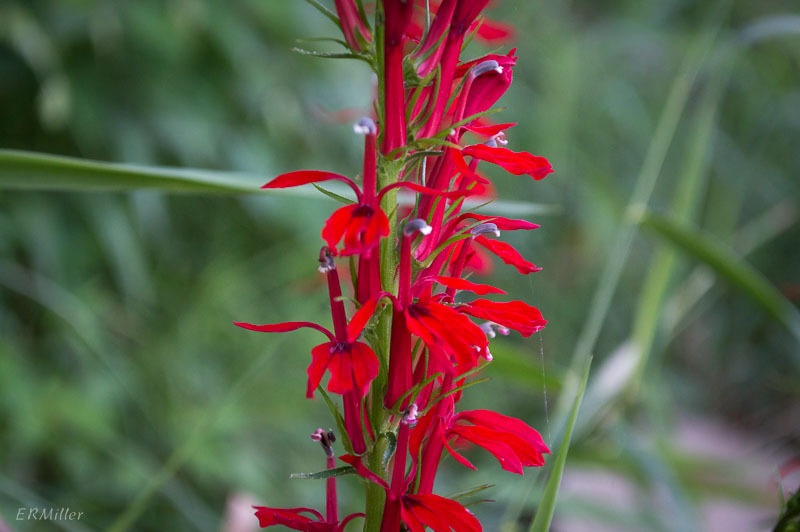 Cardinal flower is found all over the continental US, except for parts of the northern Great Plains and the Pacific Northwest. It’s listed as “salvage restricted” in Arizona, is threatened in Florida, and is exploitably vulnerable in New York.